Pure Metallic floor coating is a unique, 100% solids, two-component epoxy. It is a special formulated epoxy with a metallic pigment. It is roller or squeegee applied to your floor. This coating requires a color-coordinated primer coat, 100% solids metallic basecoat, metallic effects kit and a UV resistant urethane clearcoat (for garages) or 100% solids clearcoat (for commercial applications/heavy traffic). For more detailed information, please visit www.puremetallic.com. 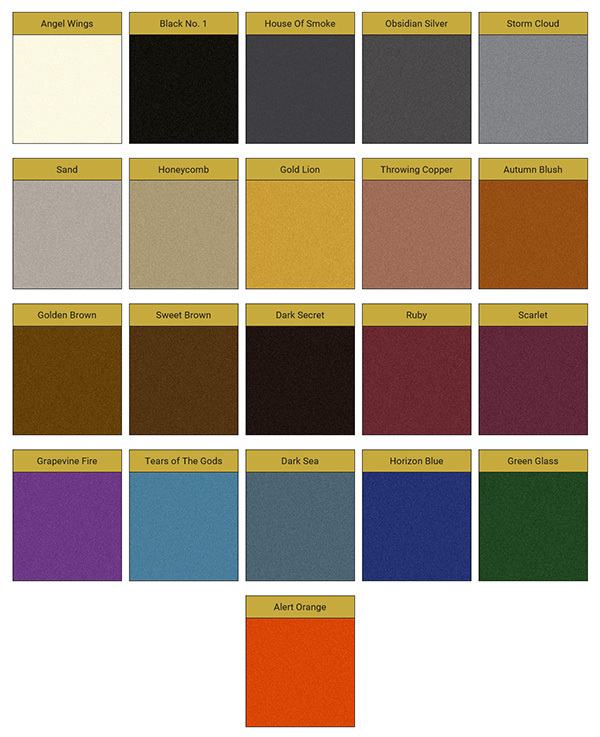 We have several color schemes available... since each color has it's own effect, we do not recommend creating your own color scheme, but use our photo gallery (updated regularly) or customer submissions at our Facebook page to see a combination we've done. That way you'll have a clearer vision of what the results will be prior to purchasing. What is Pure Metallic - Pearlescent Metallic 100% Solids Epoxy Floor Coating? The finished look is a smooth, glossy finish that has a unique and subtle texture. No two floors will ever look the same. There are endless creative techniques that can be used to create a style that you can call your own. However, it must be understood that Pure Metallic coatings are dark in nature. All of the colors are considered "dark", please take that in consideration before purchasing.